The prosecutor reads the charges against God: murder, collaboration with the enemy, breach of contract with His chosen people. Setting: A barrack in Auschwitz, with some 20 Jewish prisoners, half of whom will be gassed in the morning. Time: evening, sometime during the Holocaust. So opens “God on Trial,” an intellectual and emotional masterpiece, airing on PBS stations on Sunday evening, Nov. 9, the 70th anniversary of Kristallnacht. A half-Jew, once a respected judge in Germany, presides over the trial. A young prisoner is the prosecutor, while his father speaks for the defense. A rabbi, who has committed the entire Torah to memory, cites chapter and verse. Other inmates break in occasionally, drawing on their own experiences to accuse or defend the Almighty. In his opening statement, the prosecutor recites the history of Jewish persecution, from Babylon to the Romans to Czarist Russia, to show that God has habitually broken his covenant with the children of Israel. No, counters the defense, it is the Jews who are the contract breakers, because they forgot the Torah. Prosecutor: Why did God disperse the Jews? Defense: To spread knowledge of His word throughout the world. The defense argues that God, like a surgeon, must occasionally remove the gangrene to purify the body and usher in the golden age. Are you saying that Mengele and Hitler are doing God’s work? the prosecution asks. Do you say that only the righteous will survive? Not true. Only the cunning and shameless will survive — and will these build the nation of Israel? A former physicist from France asks for rational reasoning. It’s not about faith, it’s about who has the power, he argues. A cynical inmate notes that the buckles on the belts of German soldiers carry the motto “Gott Mit Uns” — God Is With Us — and suggests that the Almighty has decided to transfer his covenant to someone else. These few examples only hint as the depth and conviction of the give-and-take, which make our customary debates about the existence and belief in God sound like high-school exercises. It would be wrong to give away the final verdict, or the heart-stopping closing scene, but suffice that both atheists and believers will find some satisfaction and solace. 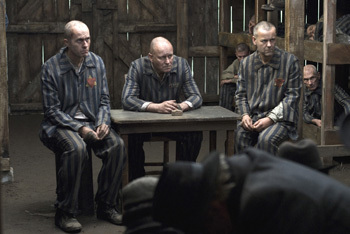 “God on Trial” was first aired by the BBC and features a superb cast of mostly British actors, including Antony Sher, Rupert Graves, Dominic Cooper, Stellan Skarsgard and Jack Shepherd. Persistent reports over 60 years have it that something resembling such a trial actually took place in Auschwitz, with Elie Wiesel frequently cited as the authority for the report. Wiesel himself, speaking from New York, set the record straight. “When I was in Auschwitz, the former head of a yeshiva and I worked together for about two weeks, carrying bricks,” Wiesel recounted. When they had a chance to talk together, the rabbi would speculate on the idea of bringing God before a rabbinical court on charges of abandoning his people. The verdict might be guilty or, at least, that God owed the Jews an explanation for the Holocaust, said Wiesel, who lost track of the rabbi, but presumes he was killed by the Germans. Wiesel doesn’t know whether the rabbi was ever able to realize his idea. Executive producer Mark Redhead (“Bloody Sunday”) and writer Frank Cottrell Boyce (“Welcome to Sarajevo”) are Christians and, speaking from London, admitted to some trepidation in tackling so sensitive and Jewish a subject. Cottrell Boyce, a devout Catholic, said, “I first talked to a number of rabbis and was assured that Jews had a long tradition of arguing with God. That impressed me, because Christians would never put God on trial. KCET will air “God on Trial” on Masterpiece Contemporary at 9 p.m. on Nov. 9.